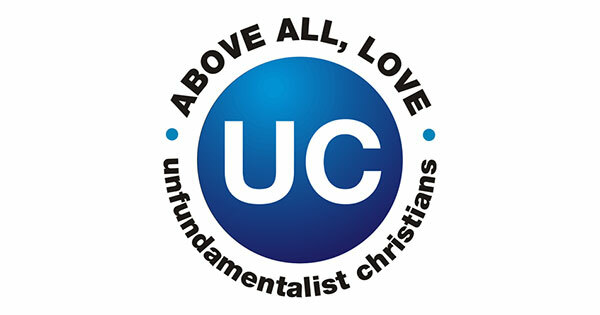 Founded by John Shore in 2012 and run by Dan Wilkinson since 2015, Unfundamentalist Christians is a group focused on following Jesus’ commandments to love God and neighbor. We’re also active on Facebook and Twitter. Jesus Christ was divine. In the course of his dutiful incarnation on earth he therefore easily (what with being divine and all) performed what to him alone weren’t miracles at all. As a means of providing for the irrevocable reconciliation of humankind to God (and so of course for each person to him or herself) he allowed for his bodily execution on the cross; by way of (yet again) proving that he was divine he then rose from the dead; for the benefit of all people he left behind the totality of him/her self in the form of the indwelling Holy Spirit, which is readily and easily available to everyone. The Bible is not a contract stipulating the rules for being a Christian. It is an ancient, massive, infinitely complex tome comprising songs, visions, histories, dreams, parables, commandments, and more. Christians seeking to follow the Word of God must look to all the words of God, ever seeking within those words the spirit of Jesus Christ. This means never failing to choose love, compassion and charity over adherence to any Biblical “law” that in practice or spirit violates Christ’s Great Commandment to love our neighbors as we love ourselves. Christianity is supposed to be all about nothing more (and nothing less!) than living a life of love, compassion, fairness, peace, and humility. The Biblical scholarship supporting the idea that Paul never wrote a word condemning natural homosexuality is more credible and persuasive than is the scholarship claiming that he did. Moreover, we remain mystified as to how any follower of Jesus could choose damning an entire population over obeying Jesus’ Great Commandment to love God and one’s neighbor as oneself. God does not want any woman automatically “submitting” to her husband or to anyone else. Using masculine pronouns to refer to God is strictly a matter of convention, a profoundly unfortunate necessity of the English language, which to date offers no satisfactory alternative. But God is neither male nor female. God is always, at once, both and unimaginably more. The belief that throughout history God chose to introduce himself in different ways into different culture streams is more reasonable, respectful, and compassionate than is the conviction that there is only one correct way to understand and worship God. There is no support in the Bible for the morally repugnant idea that hell is an actual place to which God sentences people to spend eternity in mortal agony. God’s will and intention is to forgive and teach us, not to judge and punish us. Anyone desiring to mix Church and State has failed to understand the nature and proper role of either. God can handle converting people. Our job is to love people. An all-powerful God and the theory of evolution are not incompatible. Getting a divorce is painful, and if at all possible should certainly be avoided. But in and of itself divorce is not immoral. The single most telling indicator of a person’s moral character has nothing to do with how they define or worship God, and everything to do with how they treat others. Christian fundamentalism is defined by and vigorously promotes everywhere authoritarianism, the oppression of women, homophobia, xenophobia, the “danger” of education, corporal punishment, a literal and inerrant view of scripture, “all or nothing” thinking, and a God whose primary function is to judge and punish. We are Christians who are for none of those things. And we think it’s high time Christianity stopped being associated with them. Hence our name. Also, there is nothing wrong with defining oneself by what one opposes. Martin Luther opposed the wrongs of the Catholic Church; George Washington opposed the British occupation of America; Gandhi opposed the British occupation of India; Martin Luther King, Jr. opposed racism. To oppose a negative is a positive.